http://www.JewishWorldReview.com | On the 60th anniversary of Josef Stalin's death last week, the Associated Press reported that admirers of the Soviet dictator, one of history's bloodiest tyrants, were flocking to the Kremlin to venerate him as a great leader despite his ghastly record of repression. With polls showing a rise in Russians' admiration and nostalgia for Stalin, observed AP, "experts and politicians puzzled and despaired over his enduring popularity." As many as 7 million Ukrainians were deliberately starved to death under Josef Stalin. That didn't deter prominent Americans from hailing Stalinist rule as the "moral light at the top of the world." That some Russians express approval for a despot who has been dead since 1953 is distressing, though perhaps not surprising given the ongoing campaign to burnish Stalin's image by Russia's autocratic president, Vladimir Putin. But even more of a reason for puzzlement and despair is the enthusiastic applause for Stalin by influential American liberals when he was at the height of his bloody reign -- and the willingness of similar propagandists, naifs, and true believers today to sing the praises of other thugs and dictators. In the 1930s, as millions were being murdered in Stalin's terror-famine and Great Purge, Walter Duranty was assuring readers of The New York Times that the Soviet ruler was "giving the Russian people . . . what they really want, namely joint effort, communal effort." The renowned literary critic Edmund Wilson extolled Stalinist Russia as the "moral light at the top of the world." Upton Sinclair, who would later win a Pulitzer Prize for Fiction, vigorously defended the integrity of the "confessions" extracted by the secret police from many of Stalin's victims: It "seems obvious," Sinclair wrote, that they would not have "confessed to actions which they had not committed." The adulation of left-wing dictators and strongmen by Western intellectuals, journalists, and celebrities didn't begin with Stalin (in 1921 Duranty had hailed Lenin for his "cool, far-sighted, reasoned sense of realities"), and it certainly didn't end with him. Mona Charen chronicled the phenomenon in her superb 2003 book Useful Idiots, which recalls example after jaw-dropping example of American liberals defending, flattering, and excusing the crimes of one Communist ruler and regime after another. Fidel Castro, Ho Chi Minh, Mao Tse-tung, the Khmer Rouge, Leonid Brezhnev, Kim Il Sung, the Sandinistas: Over and over the pattern was repeated, from the dawn of the Bolshevik Revolution to the collapse of the Iron Curtain - and beyond. And the useful idiocy lives on. When Venezuela's America-hating caudillo Hugo Chavez died last week, Human Rights Watch summarized his legacy starkly: "a dramatic concentration of power and open disregard for basic human rights guarantees." Over his 14-year rule, Ch�vez succeeded in rewriting the constitution to abolish the Venezuelan Senate and repeal the one-term limit for presidents. He stifled judicial independence, cracked down on freedom of speech, and used his power to "intimidate, censor, and prosecute Venezuelans" who opposed his political agenda. Ch�vez cemented Venezuela's alliance with Cuba - "the only country in Latin America that systematically represses virtually all forms of political dissent," Human Rights Watch noted - and vocally backed dictators elsewhere, including Syria's Bashar al-Assad and Libya's Moammar Qaddafi. 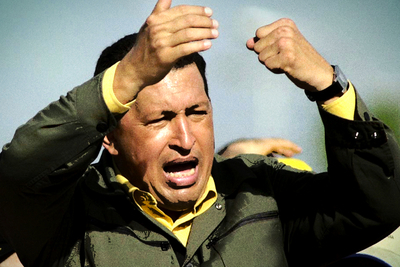 Hugo Chavez, an America-hating megalomaniac, stifled human rights, jailed critics, vocally supported dictators, and ravaged Venezuela's economy. But useful idiots in America gushed over him as a humanitarian and a moral hero. None of that troubled the ideologues who raced to praise the dead bully. Ch�vez "understood democracy and basic human desires for a dignified life," gushed US Representative Jose Serrano of New York. Former President Jimmy Carter saluted his "commitment to improving the lives of millions of his fellow countrymen." And former Massachusetts Congressman Joseph Kennedy II, a longtime Chavez booster, eulogized Ch�vez as a humanitarian who cared about the poor. All this was preceded by Dennis Rodman's return to the headlines, as the former basketball star traveled to North Korea, where the planet's most ghastly regime presides over a Stalinist hellhole in which hundreds of thousands of people are imprisoned in slave-labor camps. But Rodman, whose trip was financed by Vice Media, an American documentary production company, wasn't there to see a human-rights nightmare. He came to watch some basketball, to hang out with the country's new dictator, Kim Jong Un, and - in a country where starvation is a leading cause of death -- to eat 10-course meals that participants described as "an epic feast." All in all, the trip's organizer said, "they had a grand old time." So much so, apparently, that before a crowd of thousands, Rodman assured Kim: "You have a friend for life." Indeed. It's a shameful thing, but dictators like Kim always do.